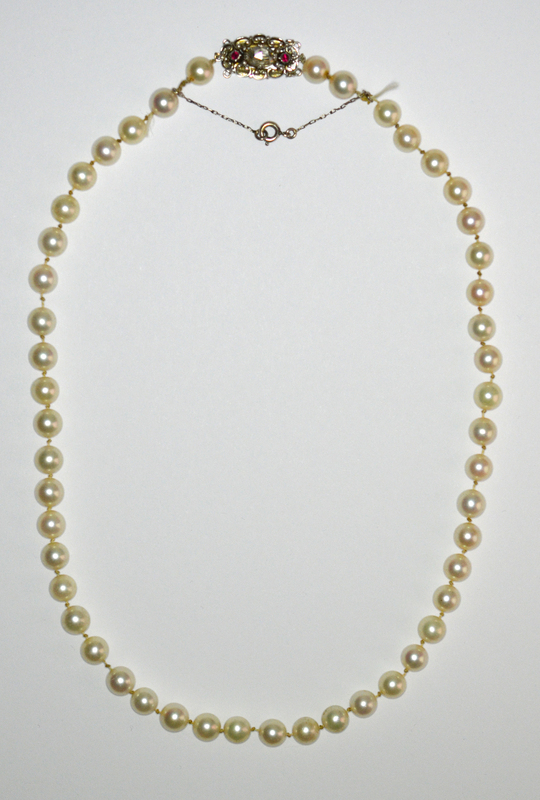 Extremely nice and rare antique late Victorian / 1900s turn of the century single strand calibrated cultured pearl necklace. The pearls are almost perfectly round with nearly identical shades of a great creamy white color and similar diameter sizes that are in the 7.1-7.4mm range. Total number of pearls in the strand is 49. Although during the times of the turn of the century and 1900s there haven't been any readily available cultured pearls we consider the present strand being one of the first that were commercially offered and produced, i.e. like the Akoya ones at around 1916. The necklace is further adorned with a fine late Victorian platinum clasp with rich foliate flower decoration, having a large rose cut / Dutch cut oval shaped diamond centerpiece and garnished by two small round cut rubies on each side. The antique rose cut diamond is a nice and bulging piece that measures 7.2x5.7mm with an approximate diamond weight of about 0.60 carats. It is perfectly clear and white such that it could be graded in the VS clarity range and H-I color range. The clasp needs a little cleaning in order to become perfectly clear of pieces of old microscopic dust. The clasp itself measures 21x12mm and has a hand engraved reverse with sun burst motifs. Apart from the clasp there is a secondary safety chain. The necklace has a circumference of 470mm (18.5") and a gross weight of 31.3 grams. All pearls are in perfect state and condition, while some of the thread appears a little worn out at two spots and might need to be restrung at some later stage. By the style of work put into the clasp, the necklace is clearly an antique piece from around the turn of the century (circa 1900). Scarce and lovely antique jewelry collector piece and one of the rare antique pearl necklaces and jewels.